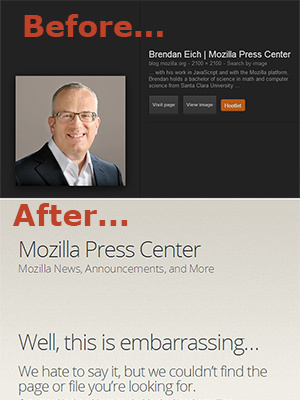 Mozilla did good today in obtaining the resignation of its newly appointed CEO, Brendan Eich. Eich gave financial support to the anti-equality Prop 8 five years ago. His belief that is okay to deny equal legal rights to gay and lesbian people makes him someone I would not want to work for or give my money to as a business. I read the words and felt patronized by the powerful straight man offering a balm to the queer minorities. Really Mr. Eich? You want to “reach out” after you spent money just a few years ago slapping gays and lesbians down, marginalizing their relationships? Or, maybe their relationships and home life happiness is irrelevant to their ability to “contribute to Mozilla” and therefore you’re actually acting consistently? Aw, thanks, for reaching out. But, no thanks. If you do not believe that I should have the same legal rights as you do, then you can put as much lipstick as you want on that pig. It’s still going to be a pig. And, your actions and statements show that you are prejudiced man who does not even recognize his own biases as being anything possibly remotely hurtful. You are stunningly ignorant of your own shortcomings and a bad choice to lead a dynamic, diverse Mozilla. I am glad that you were turfed today, Mr. Eich. I am not glad for any pain you feel, but I am glad that a corporation like Mozilla would not tolerate that you talk equality while walking down the path of injustice. This entry was posted in philippic and tagged Brendan Eich, FireFox, homophobia, hypocrisy, Mozilla, prejudice, Prop 8. Bookmark the permalink.